Our eyesight is vital for a healthy, independent and fulfilling life. Yet, more and more people experience different eyesight problems, including cataracts, macular degeneration and diabetic retinopathy (common diabetic eye disease and a leading cause of blindness). By 2020, 3 million Americans are expected to be affected by age-related macular degeneration, which is the biggest cause of blindness. What can you do to protect your eyes? Find out about foods that nourish your eyes and get a juicing recipe that will help you to protect your eyes and keep your eyesight in top condition. It’s never too late to start looking after your precious eyes. Eating the right foods is definitely an important step in the right direction and an even more convenient way is to juice certain foods to naturally protect and even improve your eyesight. It’s time to appreciate all that your eyes do for you. Maintaining a good eye health is also one of the 70 habits featured in my e-book 70 Powerful Habits For A Great Health which will guide you how to take positive steps to improve your wellness and overall health. The juice recipe that you can find towards the end of this post contains many of the following vitamins and nutrients. Vitamin A deficiency can cause night vision problems and increase your risk of macular degeneration and cataracts. This essential vitamin is important not only for your eyes, but also for the heart, kidneys, lungs, bones and general immunity. The best dietary sources include beef or chicken liver, cod liver oil, milk and eggs. Indirectly, your body can also obtain it from colorful vegetables and fruits (pro-vitamin A carotenoids – see below). With vitamin A, you need to be careful not to consume it over-keenly, as excessive amounts may be harmful. If you ingest over 2,800 micrograms (9,333 IU) per day, you can develop vitamin A toxicity, which manifests as headaches, dizziness, joint pain and skin changes. The recommended daily intake is 600 micrograms of vitamin A obtained from a varied diet of both plant and animal foods. These include alpha-carotene, beta-carotene and beta-cryptoxanthin, which the body transforms into vitamin A during the digestive process. Good sources of carotenoids are leafy greens and orange, yellow and red fruits and vegetables (kale, spinach, leaf lettuce, carrots, bell peppers, tomatoes, tomato juice, sweet potatoes, broccoli, squash, watermelon, pink grapefruit, apricots). These two are potent antioxidants and can reduce your risk of developing macular degeneration and other common eye problems. These fruits and veges can all be used to make delicious, vision promoting juices. Eggs are also a good dietary source. According to some studies, you need at least six to ten milligrams of lutein daily. Lycopene is a pigment that makes tomatoes red. Similar to lutein and zeaxanthin, it reduces the risk of macular degeneration. It has also been connected to cancer prevention. The redder the tomato, the more lycopene it contains. It’s also found in tomato juice. Other good sources include watermelon, pink grapefruit, apricots and blood oranges. You can also reduce the risk of cancer and heart disease with tomatoes. The recommended daily allowance for vitamin E is 15 milligrams (22.5 IU). It is best supplied in the form of nuts and some oil-rich foods (almonds, hazelnuts, peanuts, avocado, olive oil). It’s also found in whole grains and spinach. Vitamin C is mainly known for its immunity boosting effect. It’s also a stress fighter, which means that if your stress levels are high, you should consume more of it. Best foods for vitamin C include guava, sweet red pepper (bell pepper), kiwifruit, oranges, grapefruit, tomato, strawberries and green pepper. The recommended daily allowance is 75 milligrams for adult women and 90 milligrams for men. Also known as flavonoids. These are usually found in fresh fruit in veges that is also rich in vitamin C.
Flavonoids are powerful antioxidants and are praised for their ability to fight cardiovascular disease and certain cancers. They also protect the eyes and reduce the risk of cataracts and macular degeneration. Juicing is a great way of consuming fruits and vegetables. Juicing machines take out the fiber content of fruits and vegetables. This means that you absorb the nutrients more effectively and quickly. 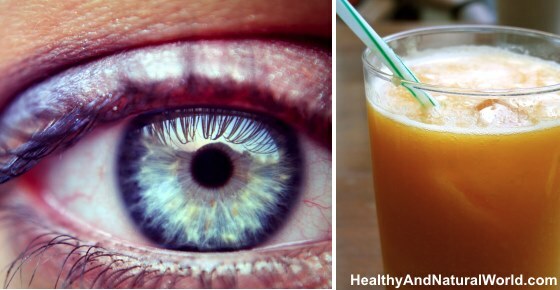 Regular juicing is a great way to improve your eyesight. However, if you prefer to consume it as a smoothie and enjoy the extra fiber it provides, use a blender and add liquid to your desired consistency. You can start your day with the following juice, which includes fruits and vegetables rich in eyesight-promoting substances. You can also add berries (see more information below on berries and how they can improve your vision). Wash your produce. If non-organic, you can use apple cider vinegar to remove the toxic chemicals (see my post on how to easily remove pesticides from your fruits and vegetables). Peel the oranges, but you can leave the seeds inside the bell pepper. Feed the fruits and veges through the juicer. You can add a dash of raw honey and coconut oil for sweetness and extra health effect (coconut oil has many health benefits). Berries are real super foods, they are rich in nutrients and fiber and are full of antioxidants. Certain types of berries such as bilberries and Goji berries can also improve your vision. If you have a problem with your eyes, such as blurred vision or inability to focus, then bilberries can help. They improve the circulation to the ocular area and enhance the pigmented area of the eyes. because of the high beta-carotene content in these berries. You can find more useful information about berries and how they can improve your health in my e-book The Healing Berry Guide which will teach you how to transform your health with berries. Rosemary – A common herb used in cooking, rosemary contains powerful antioxidants that may help retard the growth of cataracts. Take rosemary as a tea, mixing with lemon balm. Drink at least one cup of hot tea per day. Turmeric – Turmeric has a high concentration of antioxidants, especially the top three known to help prevent cataracts, vitamins A, C and E.
Herbal treatments are very versatile and effective. If you are interested in natural and herbal remedies, you can find more useful information in my e-book The Herbal Remedies Guide. This guide will teach you how to treat common ailments using herbs. Start with good eating habits as early in life as possible. If you consume a balanced diet already in your teens, it’s less likely you will develop chronic diseases – and many of these are connected to eye problems – later in life. The same goes for your children and their eating habits. Eat healthy oils, such as coconut oil and olive oil, as some vitamins and antioxidants are fat soluble, so fatty acids need to be present for the body to absorb them. Take frequent breaks when you work behind the computer to give your eyes the much needed rest. The eyes will greatly benefit from a 5 minute respite after an hour of staring at the computer screen. Just look out for a while. Or, shut your eyes and let them relax. Ive been eating goji berries, n my eyesight had improved significantly, im no longer in need to wear my eyeglasses. Goji berries are indeed packed with antioxidants, vitamins, minerals and phytochemicals and are known to improve your health – especially eyesight. were your glasses just for reading, or distance also? how long did it take? I live in West Virginia. Where can I find going berries? Fresh berries are difficult to find because they are very perishable and not many farmers grow them in USA, but you can buy dried Goji berries in many supermarkets in the section of the dried fruits, or you can buy dried or powdered berries or in a juice form online shops like Amazon. Berries are so great on so many levels. I have been eating blueberriesand raspberries every day for years and my eyesight has not deteriorated at all. They could also help to prevent cancer, protect the heart, ward off UTIs, and have lots of fibre. Just make sure they are organic because berries are sprayed heavily with pesticides. Does dry goji berries have the same benefits? Generally speaking, dried fruit has lost a small percentage of its vitamins during the dehydration process (see in SFGATE website). However dried goji berries are still packed with nutrients, and as fresh ones are difficult to find, dry ones are a good alternative. I’m not sure if the additional natural stuff can help in your case. The goal of glaucoma treatment is to lower pressure in your eye and I don’t think the natural stuff can help in this case. Is there frozen goji berries? Does the health food/superfoods stores carry frozen? Frozen would be the next best thing to fresh? I couldn’t find frozen Goji berries. You can find dried Goji berries in many supermarkets in the section of the dried fruits, or you can buy dried or powdered berries or in a juice form online shops like Amazon. Generally speaking, dried fruit has lost a small percentage of its vitamins during the dehydration process, however dried goji berries are still packed with nutrients, and as fresh or frozen ones are difficult to find, dry ones are a good alternative. I have farsightedness, can I use this natrual remedy, and will it work? I don’t know how serious your problem is, and there is no guarantee for 100% success for any remedy, but why not try? Sounds good! I love going natural. Most of our health related problems lies in the distance we have created between us and the nature. Reverting back to the nature is the remedy of our so many health issues. So, why not replace the junk food with healthy natural and delicious foods as soon as possible?